Kumquat means gold orange in Chinese and these fruits are thought to be native to China. They are referenced in Chinese literature as far back as the 12th century. Kumquats are tiny orange or yellow, football-shaped fruits and are related to citrus fruits, however, in 1915, they were given their own genus, Fortunella instead of being considered a citrus fruit. Kumquats are an unusual fruit because the edible skin is sweet and the flesh is quite tart which leaves a pleasant citrus taste in the mouth. These delicious fruits grow on small evergreen trees that grow to approximately ten feet high. 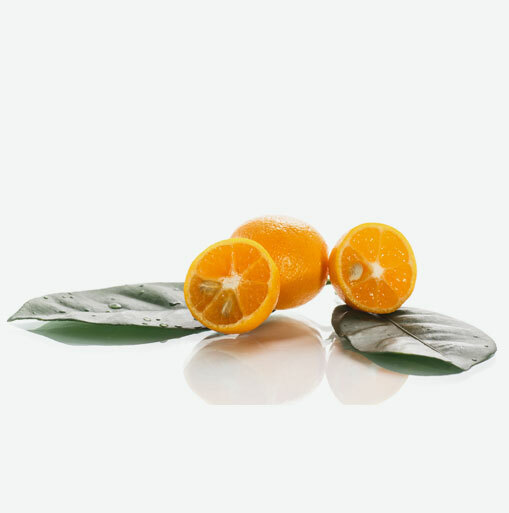 Kumquats deliver a good dose of vitamin C which helps to maintain a healthy immune system. They are low in fat and calories which makes them a healthy snack. These oval shaped gems deliver other nutritional benefits such as fiber to help maintain regularity and they contain traces of calcium which is an important mineral for healthy bones. Look for kumquats with golden-yellow to reddish-orange skin. Choose fruits that are firm and heavy for their size. Avoid kumquats that are too soft or have bruising. They can be refrigerated in a plastic bag in your refrigerator up to a week. Wash the kumquats well just before using. Did you know that one pound of kumquats equals approximately 24 small fruits? Kumquats are eaten whole, candied, pickled, and used to make relishes, preserves and marmalades. These interesting and delicious fruits can be eaten raw as a snack or added to salads. Kumquats do not need to be peeled. They can be eaten with the skin on. Serve them like grapes as a snack. Kumquats have a distinctive taste with their sweet peel and sour juice. The seeds should not be eaten. Use kumquats in baking to add flavour to cakes, cookies, pies and muffins. Kumquats also complement seafood, chicken or pork dishes.